The Little Swift (Apus affinis), or House Swift, is a small bird, superficially similar to a Barn Swallow or House Martin. 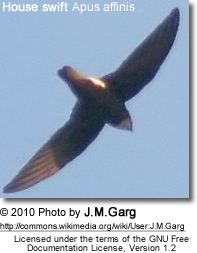 It is, however, completely unrelated to those passerine species, since swifts are in the order Apodiformes. The resemblances between the groups are due to convergent evolution reflecting similar life styles. 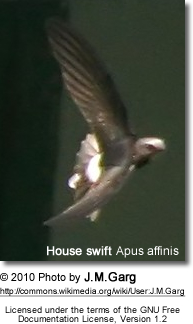 The eastern race, House Swift, is sometimes considered a separate species, Apus nipalensis. The scientific name comes from the Greek απους, apous, meaning "without feet". They never settle voluntarily on the ground. 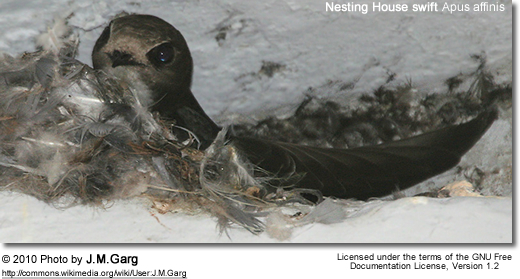 Little Swifts build their nests in hole in buildings or sometimes on cliffs, laying 1-4 eggs. A swift will return to the same site year after year, rebuilding its nest when necessary. A species of bedbug Cimex hemipterus has been recorded from its nest in India. 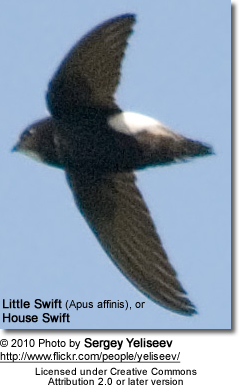 Little Swifts are readily identified by their small size. Their wingspan is 33cm compared to the 42 cm of Common Swift. They are black except for a white rump, the white extending on to the flanks. They have a short square tail. These birds have very short legs which they use only for clinging to vertical surfaces. The flight is fluttering like a House Martin. Copyright: Wikipedia. This article is licensed under the GNU Free Documentation License. It uses material from Wikipedia.